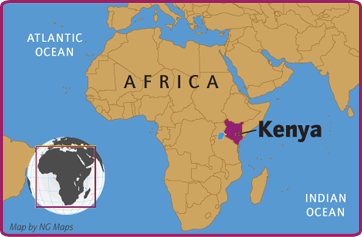 Kenya | Global Disability RightsNow! To advance the rights and foster inclusion of citizens with disabilities in Kenya, participation from all segments of society is needed. Join the movement! The RightsNow! project is honored to work with disability advocates and allies in Kenya to strengthen communities through disability rights implementation. The rights of people with disabilities in Kenya are recognized under the national People with Disabilities Act of 2003 (PDA), and in the very progressive 2010 National Kenyan Constitution. Key agencies involved with promoting disability rights include the Kenya National Human Rights Commission, which has the authority to investigate, report and enforce the CRPD, and the National Council for Persons with Disabilities which is charged with ensuring implementation of the CRPD and other disability rights instruments. In 2014, the Kenyan Parliament began the process of amending the PDA to align with the CRPD, which was ratified by Kenya in 2008. In 2013, Kenya began government decentralization, devolving power, resources, and representation to the level of its 47 counties. This process has proven beneficial to people with disabilities as individuals can now advocate for actions on the rights of people with disabilities locally rather than in Nairobi. However, disability laws continue to not be implemented or effectively enforced, and funds allocated for accessibility and inclusion may be reallocated to other projects, or like other funding in Kenya subject to corruption. Disabled People's Organizations (DPOs) are working to advance disability rights and have taken an active role in government negotiations and policy review, building the capacity of advocates to use legal frameworks, and participated in the country’s CRPD shadow report. Although DPOs are established throughout the country and are run by people who have a passion for inclusion and justice, they are largely volunteer-based and lack funding. Despite a lack of funding, their efforts are slowly but surely making progress. Increasing the political representation of disabled citizens and building DPO capacity to enforce rights remain key priorities. The RightsNow! project welcomes all people to become actively involved in moving the disability rights agenda forward in Kenya using the tools and resources made available in the Global Disability Rights Now! resource center. January 2015: MIUSA partnered with United Disabled Persons of Kenya (UDPK) to conduct project activities in Nairobi. UDPK is a federation of organizations for persons with disabilities, and their mission is to promote full and effective participation of people with disabilities in socio-economic and political spheres as enshrined in legal frameworks. August 2018: MIUSA partnered with Kenyan National Association of the Deaf (KNAD) to conduct technical assistance activities in Nairobi. KNAD has eleven affiliated branch associations and three regional offices, and provides a national platform for Deaf rights and Kenyan Sign Language advocacy. April 2015: The RightsNow! team conducted a 5-day introductory visit to Nairobi to identify key thematic areas to focus on regarding the Persons with Disabilities Act of 2003, the 2010 Constitution and implementation of the CRPD. The U.S. experts co-facilitated three forums over the course of a week with DPOs, human rights and civil society organizations, and government officials from the national and county levels. The visit was planned and implemented in collaboration with UDPK. January 2016: RightsNow! sent a team of experts in disability rights training and disability law to conduct a five-day training in Nairobi with 36 leaders from 16 counties who represent disability organizations and government bodies. 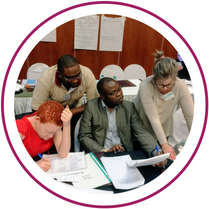 Training topics included U.S. and Kenyan disability laws, coalition building, political advocacy, and action planning. As a result of the training, 34 action plans were developed on issues such as accessibility in higher education, physical access to public buildings, prevention of gender based violence among women with disabilities, and access to justice. The training was planned and implemented in collaboration with UDPK. August 2018: RightsNow! sent a U.S. expert on Sign Language Interpreter qualifications and certification to Nairobi to work with the Deaf community, sign language interpreters, government, disability community and Universities to develop a strategic and unified action plan that would be implemented by a technical committee to develop sign language interpreter standards and certification. The technical assistance visit was planned and implemented in collaboration with KNAD. 2015-2018: The RightsNow! Consortium provided technical assistance to DPOs, CSOs and government on implementation of disability rights laws in Kenya, which included consultations on accessible transportation, inclusive education and political participation.